© 2017 by Bruce McAllister. There was one girl I really liked in school when I returned to Earth, but it took me three months to say hello. I wasn’t good with human beings. We’d just gotten back from Pitipek (a red-dwarf star system “just left” of Tau Ceti, as the joke goes). My father had been stationed there for two years with the TU’s Planetary Safety Agency, and living with the slow, enigmatic, bipedal Pitipeki—especially in one of their villages, and under those endless clouds—tends to make you lose your people skills. In fact, it can really change you. The girl’s skin was as white as Pitipek’s brightest moon, her hair as dark as a pench’s eyes. Just beautiful. I didn’t know what she thought of other colors—in my case, a boy who was on the greenish side because his grandfather, a famous genengineer who’d been incarcerated once for gene crimes, had mapped him to have skin like that . . . and maybe a few other things. Like a little talent at art. I said “hello.” It was an overcast day, and we were taking a break in the hallway from geopol simming. She said “hello” back. I could tell from her voice and the way she looked at me that my skin wasn’t a problem. A week later I said “hello” again, and I knew this would continue for the entire school year if I didn’t do something special. I’d had a human girlfriend on Pitipek, another PSA officer’s kid, in the village down the road—her name was Clare—but she’d disappeared that second year, her body never found. That does something to you. No one on Earth makes paintings anymore—not really—but the Pitipeki do. I’d had Pitipeki friends—young males—my age in the village who made them every day. Every painting has a purpose for them, a practical one. Spinota peluga ma villea, the Pitipeki say. A painting must do something. It’s not about “art.” It’s about—how to put it? Relationships. Power. Getting what you want. I’d learned to paint in that village the way the Pitipeki do—there wasn’t much else to do—but I hadn’t learned everything. So I made a painting for Mala—that was her name—her dad was a politician, people said—a painting of the village I’d lived in. I gave it to her after school as she was about to board the rail to her neighborhood and I was about to board mine. She looked terrified for a moment. This was a lot more than a “hello.” But if I kept talking, I told myself, she’d calm down, wouldn’t she? I hoped so. I didn’t want to scare her. She did. The painting was strange, and so was the boy with the greenish skin, but he was just a boy, wasn’t he? Strange, not creepy. “It’s really big,” she said, trying to be nice. “I only make big paintings,” I said, laughing. It was a joke. Was I art to her? That made her laugh. The painting—she kept looking at it—was doing what I’d hoped it would. I was holding the painting upright next to us, one hand on it to steady it. It was big, as tall as we were—a vertical landscape, a village, a marlic hut and a door you were supposed to look at, so I’d made the door red and put sunlight on the path leading to it. I picked up the painting and led her to the shade side of the station. Everyone else was further down the track. This made her laugh too. She was trusting me, and that felt good. “I got that impression,” she said. She did, and who wouldn’t? She looked at me, then the painting, then me again. No boy had ever given her a painting before, I knew. She touched my elbow—her hand lingered, and my arm tingled—and with the other hand reached out to the painting. Then she hesitated. She did. She moved her hand over the surface, loving the feel of it as everyone does when they touch a Pitipek painting. Like fur, like little teeth, tickly. When her arm disappeared into the painting, I stepped back to let what needed to happen happen. No one could see us. She screamed once, a tiny sound lost in the whish of a passing rail, and her other arm, in its pretty sky-blue sleeve, tried hard to pull the first one out, grabbing, holding on, but that arm disappeared too in a swirl of green. Her skinny legs, shaking terribly, did their best to fight it, but were swallowed by the oily green, too; and in a second—with one more little scream, one that made me remember a day in the village—she was gone. She was mine. That’s what this kind of painting was for. You make it and give it to someone you want to have forever. I’d learned that on Pitipek, but I’d never learned the rest. I’d tried hard with the “release” minerals, the required patterns, but could never pull it off. An arm would appear—the skin white as paint, shivering, a voice somewhere far away shrieking—or a hand, or a foot—but then it would snap back into the green. Every time my friends would laugh in that gargly way Pitipek laugh. What do you do with someone once you have them? I took the painting home, thinking it would feel different, heavier or something, but it didn’t this time either. No sounds from it. Nothing moved on the surface even for a moment. I wondered—just for a moment—what she was feeling, if she was feeling anything. I started another one late that night. I had lots of paint left. I’d spent weeks in the village making it. There was a girl with yellow hair at school—her skin bronzed by the sun—and I didn’t want to spend months on hellos with her, too. I was pretty sure I loved her, but after Pitipek it’s hard to know. 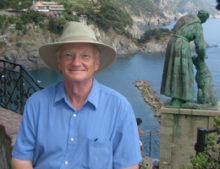 Bruce McAllister’s short stories have appeared over the years in many of the SFF field’s major magazines and in various “year’s best” volumes, and have won or been short-listed for awards from the National Endowment for the Arts, the Shirley Jackson Award, the Nebula, the Hugo and others. He is the author of the novels Dream Baby and The Village Sang to the Sea, and the collection The Girl Who Loved Animals.